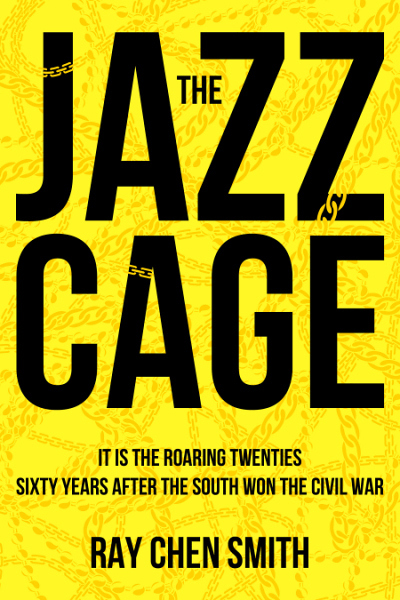 Today I welcome author Ray Smith who is here with a brief excerpt from his new book, The Jazz Cage. Read on to find out more! Della crouched behind the shrubs, held onto Cece, and prayed they hadn’t been noticed. Through the scant leaf cover, she could no longer see the mounted patrolman who’d appeared a block away. Just the same view of the lifeless Richmond neighborhood with its red brick homes, every window black at four in the morning. The nearby James River rapids roared and the singsong of night insects further muffled the cop’s movements—just as they had earlier muted the women’s escape from the plantation. Despite her prayers, Della soon heard the clip-clop of approaching hooves. Through the leaves, she first spied the horse’s head, then its flank, then the stirrups and black boots of the patrolman. Black boots, black jodhpurs, black tunic, black helmet, and on that black helmet, the silver bird. She felt Cece recoil beside her, and she knew the younger woman had also spotted the emblem. This was no ordinary policeman but a deputy of the Fugitive Slave Agency. Della pressed her forefinger against Cece’s lips, and when that failed to quiet her frantic breathing, she clamped her hand over the poor girl’s mouth. Ray Chen Smith is a writer and teacher living in Los Angeles, California. For his second novel, he decided to go unabashedly commercial, and The Jazz Cage is the result. He is currently finishing up his third novel, a thriller titled Dawn at Midnight. He also welcomes comments, positive or otherwise, to his email address: raychensmith@gmail.com. He promises to answer each and every email. Thanks a bunch, Nicki! If anyone would like to follow me on Twitter, my Twitter name is ray_chen_smith, not raychensmith. Long story. Thanks!